Many sports require production of repeated maximal or near maximal efforts (e.g. sprints) interspersed with brief recovery over an extended period of time. This is known as repeated sprint ability or RSA . It has been noted that sprinting generally constitutes 1-3% of effective playing time . In the literature, sprinting is often referred to as speeds faster than 5m/s. However, in my opinion, running between 5-7m/s (20sec – 14sec 100m time respectively) cannot be considered a sprint otherwise you should consider a new sport that doesn’t require sprinting but that’s a whole other topic. While sprinting doesn’t constitute to much of a match, sprinting often occurs in critical parts of a match such as breaking through the line, chasing down a defender and competing for a 50/50 ball. A -0.8% decrement in sprint speed has a substantial effect on the likelihood of a player losing possession when competing for a 50/50 ball . Not only this, the concept of “speed reserve” plays a part in the overall conditioning of a player which will be explained later in this article. For the purpose of this article, sprinting will refer to maximal effort for less than 10sec. Some quick definitions for this article taken from Girard et al. . Intermittent sprints involve short maximal sprints with near complete recovery (60-300sec) while repeated sprints involve short maximal sprints with incomplete recovery (less than 60sec). 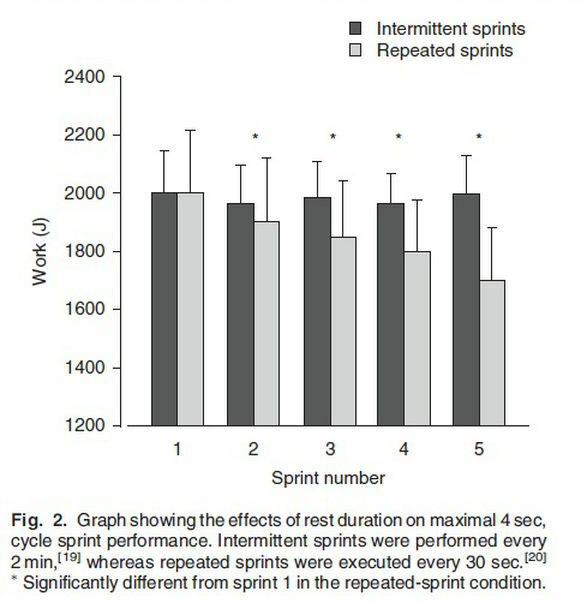 The main difference is that during intermittent sprints, there is little or no performance decrement whereas repeated sprints show a marked performance decrement. Fatigue during repeated sprints typically develops rapidly after the first sprint (shown in graph below). Generally, the greater the speed on the initial sprint, the greater decrement in repeated sprint ability due to the higher anaerobic contribution and the change in physiology that comes along with it . What Are Some Of The Limiting Factors Of RSA? For the purpose of this article, we will just focus on the limitation of energy supply. In this case, energy is referred to adenosine triphosphate (ATP). This is the energy source for muscular contraction. As energy is used, ATP loses phosphate and now becomes adenosine diphosphate (ADP), meaning 2 phosphate molecules. ADP can be further broken down into AMP where there is one phosphate molecule but we’ll leave that out of this discussion. For the body to restore energy, phosphocreatine (PCr) supplies the phosphate molecule for ADP to become a full ATP again and therefore, ready to supply more energy to the working muscles. This is where energy systems come into play. As you may know, energy is synthesised (made) in 3 different energy systems. The ATP/CP, Anaerobic and Aerobic energy systems. I’m sure many of you have been taught some background into each energy system where ATP/CP system lasts approx 10sec, anaerobic approx. 60-90sec and aerobic is for long duration exercise. While this may be true to an extent, it is important to note all 3 energy systems are utilised when using energy with one being emphasised more than the other. The same goes when restoring energy. A maximal 6 sec sprint can reduce PCr stores by 35-55% of resting levels and complete recovery of phosphocreatine stores can require more than 5mins. This is most likely due to fast twitch muscle fibres having higher energy demands than slow twitch fibres during maximal exercise . Recovery times during repeated sprint exercise often doesn’t exceed 60sec, hence energy stores may only be partially restored before the next sprint. It has been suggested that a better maintenance in power output (an important variable in sprint performance) could be attributed to a faster rate of PCr resynthesis during recovery between sprints . Anaerobic glycolysis supplies approx. 40% of the total energy during a single 6 sec sprint and progressively has less involvement in subsequent sprints . If anaerobic glycolysis contributes 40% of total energy during the first sprint, shouldn’t we also highly develop this energy system to improve repeated sprint exercise? There a couple of ways to look at this. The individuals with the highest contributions of ATP from the anaerobic metabolism when sprinting often have the highest initial sprint performance which has been correlated well with total sprint performance in repeated sprint test . However, increasing the supply from the anaerobic glycolysis system could be detrimental to RSA due to the negative correlation between anaerobic ATP production during the first sprint and sprint decrement during a repeated sprint test . Overall, it is unclear however whether increasing the ability of the anaerobic glycolysis system to resynthesise energy will lead to improvements in RSA. During a single sprint, the aerobic metabolism only contributes <10% of total energy expenditure. However, as sprints are repeated, the contribution of the aerobic metabolism may increase to as much as 40% of the total energy expenditure. Furthermore, individuals may even reach their V02max! This suggests that RSA may be limited by V02max and individuals with a higher aerobic fitness level should be able to rapidly restore PCr between sprints as well as having a greater ability to resist fatigue [1, 2]. Thus, aerobic metabolism is essential for PCr resynthesis during recovery of high intensity exercise (e.g. sprints, tackles etc) . So How Do We Enhance Your RSA And Therefore, Enhance PCr Production With Training? Many team and individual sports require the ability to sprint repeatedly without complete recovery between bouts. So to enhance sporting performance through RSA, we must 1) enhance sprint performance (get faster) and 2) enhance the ability to recovery between sprints. What we must take into account is the total amount of training you can fit into a week and structure it well enough where you aren’t sitting in a highly fatigued state often. We have previously written about getting faster which you can find in our agility/speed series found HERE. To add to this, pure speed training should take place twice a week if you are not in season and compete in a sport where speed is highly important. This will also cover your training of the ATP/CP system. But how about your ability to recover between sprints? Many coaches/athletes use repeated sprint exercise to enhance repeated sprint ability (e.g. shuttle sprints). In theory, it makes sense. Do the activity you are trying to get better at and you will get better at it. However, what are we repeating in this instance? If an athlete is slow, we are constantly repeating slow efforts. It should also be mentioned that if we incorporate repeated sprint exercise into our training week, something has to come out and most likely, this would be pure speed training due to the intensities. Furthermore, are we effectively developing the aerobic or anaerobic energy systems? As stated above, the aerobic metabolism only contributes to less than 10% during the first sprint and up to 40% during sprints later in the series while anaerobic glycolysis can suffer an 8 fold decrease in its energy production from first to last sprint . In Lyle McDonald’s endurance training series HERE, he states the anaerobic energy system develops very quickly and can be maximised in just 3 weeks of training and has very little room to improve compared to the aerobic system. So why spend your whole off/preseason running yourself into the ground with constantly high heart rates, high levels of fatigue that interfere with other aspects of your training and under developing an entire energy system? NOTE: training methods below are methods I have used personally or with athletes and sports teams mostly taken from Joel Jamieson’s Ultimate MMA Conditioning. These are in my opinion the best way to develop the qualities below. While this may not cover all possible methods, some I just don’t like for developing RSA or I haven’t tried them. Cardiac Output: Improving how much blood you can pump with each heart beat . Also known as “steady state cardio.” Can be done on any piece of cardio equipment or outside. Keep heart rate between 130-150BPM or 120-140BPM if sitting or lying down. Can be done 1-3x a week. High Intensity Continuous Training (HICT): Increasing endurance of fast twitch muscle fibres . Best performed on a spin bike. Crank the resistance as high as you can while maintaining a pace of 20-30RPMs while “unloading” the leg at the top each revolution to prevent the muscle burning sensation. Heart rate should sit between 150-160BPM. Can be done 1-2x a week. Tempo Running: Not known how it works, but it does. Championed by extraordinaire sprint coach Charlie Francis to develop aerobic and technical abilities in Olympic and World Champion sprinter Ben Johnson among others. Performed at approx 75% of maximum speed (e.g. if you can run a 12sec 100m, then you would perform your 100m tempo runs at a pace of 17sec). Distance ranges from between 50-300m depending on your sport and ability to maintain posture and running mechanics. Doubles as a way to reinforce proper running mechanics and strengthens running posture over longer distances. Allows you to perform high speed aerobic work over long distances. Perfect for team sports. Lactic Power Intervals: Improves pure power output and ATP contribution from the energy system . Has to be performed at 100% maximal effort (e.g. maximal sprints). 3×20-40sec efforts with 1-3mins of rest between reps.
Lactic Capacity Intervals: Similar to above, but increasing how long you can maintain lactic power for (i.e. ability to continually resynthesise ATP) . 3×90-120sec efforts with 1-2mins between reps.
Here’s a sample template for your conditioning to enhance not only your maximal speed but your ability to repeat it. This template is perfect for the team sport athlete that requires sprinting speed. Sports that require high levels of maximal efforts that aren’t sprinting (e.g. martial arts) will require different methods. I hope this gives some insight into how to train to enhance your ability to repeatedly sprint and to make you think if endless shuttle runs and circuits are really enhancing your sporting performance or just putting you into high levels of fatigue. Girard, O., Mendez-Villanueva, A., Bishop, D., Repeated-Sprint Ability – Part 1. Sports Medicine, 2011. 41(8): p. 673-694. Bishop, D., Girard, O., Mendez-Villanueva, A., Repeated-Sprint Ability – Part II. Sports Medicine, 2011. 41(9): p. 741-756. Jamieson, J., Ultimate MMA Conditioning. 2009: Performance Sports Inc.